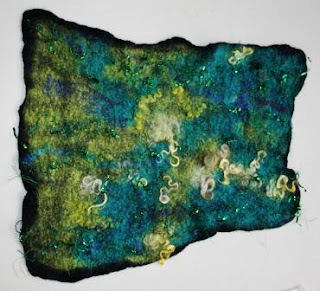 Our Felting Workshop last Sunday with Juju designer June Hope was just wonderful. Those attending were surprised at their output and I have enclosed some finished pieces for you to look at. 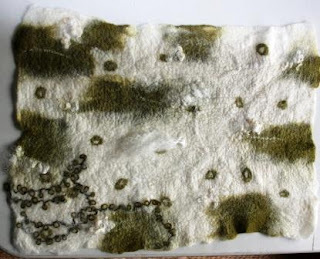 By combining wool, alpaca fibre, wools, silks and other embelishments, the results were absolutely beautiful! 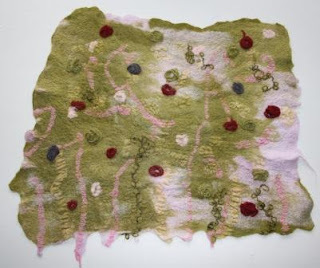 On average, the fabrics were 500 x 400 or larger and big enough to either make up into a garment or accessory, or perhaps frame and hang as a piece of textile art. Thanks to June for her excellent teaching technique and congratulations to the participants on their achievements! We will be holding another workshop with June in the second half of the year. If you would like to put your name down, email me and we will send you details when they become available.